MURFREESBORO, Tenn. -- MTSU's Center for Popular Music will be among locations to be included in Phase I of the Tennessee Music Pathways, a statewide initiative that identifies, interprets, promotes and preserves well-known and lesser-known music events, locations and stories across the state. Gov. Bill Haslam and the State Legislature approved funding for the development, roll out and execution of the initiative. The Tennessee Department of Tourist Development officially announced the MTSU center's inclusion this week and presented university officials with the black and white marker to be prominently displayed inside the Bragg Media and Entertainment Building where the center is housed. Watch a recap of the presentation at https://youtu.be/It-vxx_Mqnc. 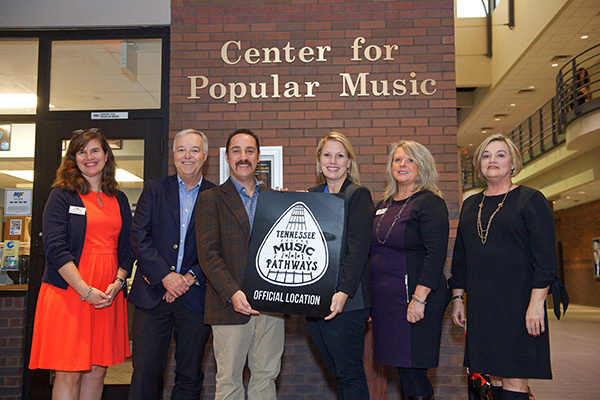 The Music Pathways program is designed to guide visitors to destinations through an online travel-planning experience featuring hundreds of attractions, markers, statues, murals, resting places and experiences that showcase Tennessee's music heritage. The pathways not only will feature an array of genres that include, but are not limited to, the seven musical genres blues, bluegrass, country, gospel, soul, rockabilly and rock 'n' roll -- that call Tennessee home. "Tennessee Music Pathways connects fans to the people, places and genres that make Tennessee the Soundtrack of America. From the largest cities to the smallest communities, this statewide program identifies, explains, and preserves the legacy of music in Tennessee," said Commissioner Kevin Triplett, Tennessee Department of Tourist Development. "Our goal is to not only connect the fans to the music, but to inspire travel to a destination along the Pathways to potentially stay longer on their musical journey." The Center for Popular Music, or CPM, a part of the College of Media and Entertainment, is located in Room 140 of the Bragg Media and Entertainment Building. It is one of the nation's largest and richest repositories of research materials related to American vernacular music. Greg Reish, director of the center, said the Music Pathways designation came about following a visit by Triplett months ago. He was seeking the center's assistance in finding resources to document the history of the various sites that were going to be named. He was so impressed by the center's wealth of historical resources that he added it to the list, Reish said. "It's very nice that a center that was established in 1985 in order to document the richness and the history of music-making in this region and nation at large, it's very gratifying that it has grown now to be recognized as a site that's an important part of that history in and of itself," Reish added. Ken Paulson, dean of the MTSU College of Media and Entertainment, said the center represents his college's ongoing efforts to provide students with a comprehensive education that meets the challenge of providing "a glimpse of the future" while also providing the context of an art form that has transitioned from vinyl to digital and various phases in between. "We're always looking to the future, but what is so critical to our students also is to have a grounding in the past, and the state of Tennessee is so rich in musical past," said Paulson, noting that he'd just discussed in one of his classes legendary Tennessee musical figures such as Sam Phillips, Jerry Lee Lewis, Johnny Cash and Elvis Presley. "There's no state more steeped in the history of popular music, rock music and country music and the culture that makes the state special. 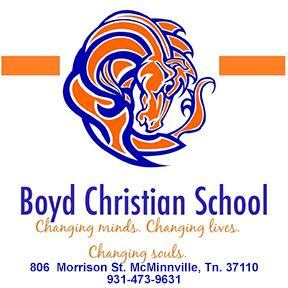 We are grateful to be a part of the pathway." Phase I locations are designated as being important locations in telling Tennessee's music story or promoting live music or both. Barbara Wolke, senior vice president of the Convention and Visitors Bureau at the Rutherford County Chamber of Commerce, said that in addition to the Center for Popular Music (official location, research), other Rutherford County locations along the pathway include Miller's Grocery in Christiana (official location, venue), the Uncle Dave Macon Days held at Cannonsburgh Village in Murfreesboro (festival) and the Uncle Dave Macon historical markers. Wolke noted that the latest economic impact reports show that tourism pumps $350 million into the county annually and believes the pathway designations should help increase that number. "We're looking forward to working with Tennessee Music Pathways to bring more travelers ... to Rutherford County," Wolke said. "This initiative will enhance Tennessee." The Tennessee Department of Tourist Development has worked with the state historian and a review board to identify more than 500 possible locations for markers, including birthplaces, resting places, hometowns, high schools and churches, locations of first-known recordings or performances of the musical pioneers and legends. Melanie Beauchamp, director of outreach and engagement at the Department of Tourist Development, noted that the CPM is one of the few places "not only in the state, but across the country, with the resources to study, research and learn about music and its history than the Center for Popular Music." Signage and markers for Phase 1 will be installed through December 2018. For more information on the initiative, visit www.tennesseemusicpathways.com. For more information on MTSU's Center for Popular Music and its projects and special events, visit www.mtsu.edu/popmusic.